A fantastic announcement has been made today by the International Paleolimnology Association (IPA) regarding PAGES' former Scientific Steering Committee member and co-chair Sheri Fritz. "Put your hands together for Prof. Sheri Fritz, who will receive the Lifetime Achievement Award from the IPA! The award honors Dr. Fritz' career contributions to paleolimnology. She has accumulated a stellar record of achievement in the field of diatom taxonomy, biogeography, and paleo-environmental interpretation. Her work has had a wider impact across the fields of ecology, limnology, and paleoclimatology. She will receive the medal at the upcoming IPA meeting, which will be held in Stockholm, Sweden next June. Congratulations to Sheri on this well-deserved award!" PAGES also congratulates Sheri on this amazing accolade and recognition of her work. We are very proud of her achievements. She joined PAGES SSC in 2012 and became the co-chair in 2016. Her six-year tenure finished in December 2017. 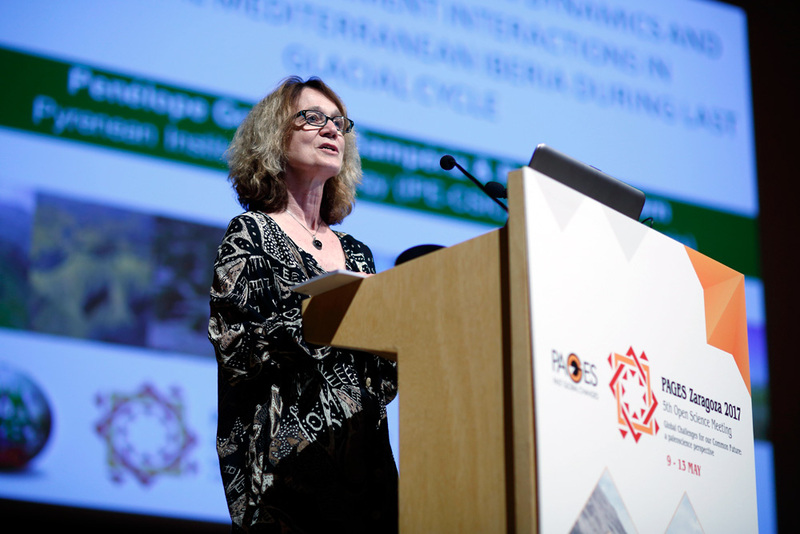 She is pictured at PAGES' 5th Open Science Meeting in Spain in May last year. Read more about the June meeting in Sweden here.